Hey guys! 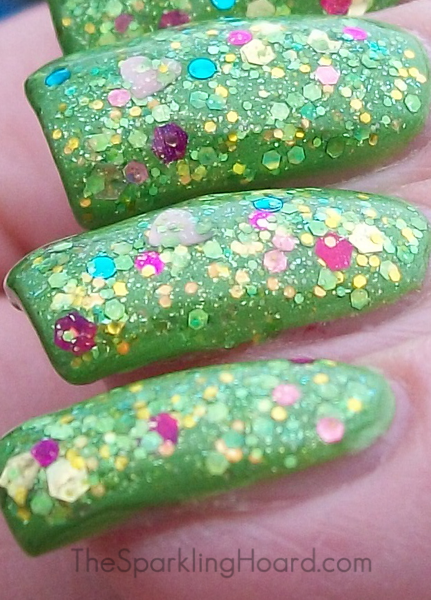 It's rather funky and rainy today, so I'm reaching into my backlog of photos to bring you a cheery and springy polish from Femme Fatale Cosmetics! 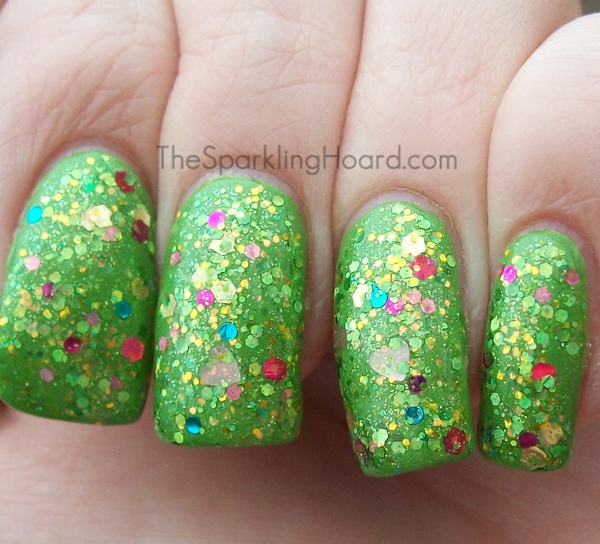 Keeper of the Grove is a glitter topper with a faintly green base. It contains a mix of pale pink hearts, pink and blue circle glitter, green shimmer, and green, pink, yellow, and gold hex glitter (some metallic, some holographic). It's gorgeous and sparkly in real life, but I was unable to capture the sparkle on camera that day. The hearts are somewhat sparse, so don't expect to get one on every nail. The formula was good and the dry time was fast. Shown is one coat of Femme Fatale Keeper of the Grove over two coats of China Glaze Tree Hugger. Keeper of the Grove costs $13 for 12mL at Llarowe. It is also available directly from Femme Fatale (Australia), Norway Nails (Norway), and Shoppe Ecclectico (Singapore). Harlow & Co. and Ledouxnuage (France) also sell Femme Fatale polishes, but Keeper of the Grove is not currently listed on their sites. It is important to note that unless you live in Australia, it can be hard to catch these polishes in stock on stockists' websites. Be sure to sign up for e-mail newsletters and Like your favorite stockist's Facebook page so you can be made aware of restock dates! To stay up-to-date on upcoming Femme Fatale polishes, Like their Facebook page. It is! I love it so much. The Sparkling Hoard Dot Com Mini Giveaway!